Germany΄s finance ministry yesterday issued a quick clarification after a same-day Bild article claimed that German FinMin Wolfgang Schaeuble has “reversed” his position over any future transformation of the European Stability Mechanism (ESM). A ministry spokeswoman reiterated that Berlin continues to oppose the joint assumption - by the Euro zone - of individual member-states΄ public debt and the issuance of a “Euro bond”. 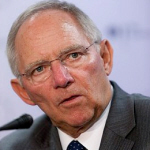 Daily Bild earlier reported Schaeuble would unveil details to reform the European Stability Mechanism (ESM) after German parliamentary elections next month, and that governments would be allowed to use the fund to boost investments during recessions. Bild said Schaeuble΄s proposal was a goodwill gesture towards French President Emmanuel Macron who has promised to work with Germany on a roadmap for closer euro zone integration.